Do you need to record movies and video away fro the grid? 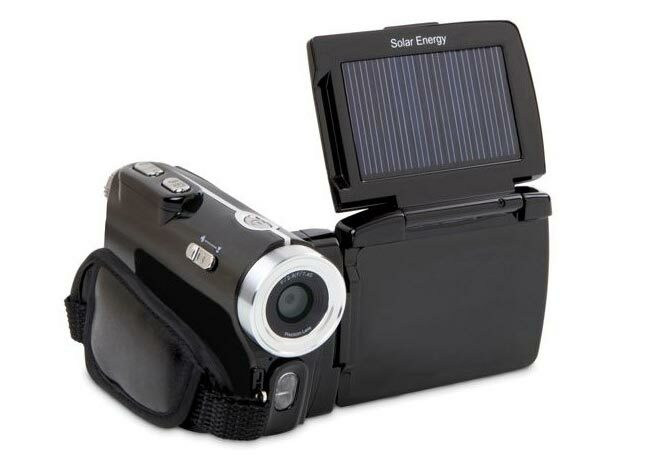 If you do then this neat little camcorder that has its own built in solar panel to charge itself might be the perfect gadget for you. The tiny solar flip-up solar panel extends the battery life of the camcorder by 12 minutes for every hour it’s exposed to the sunlight. The camcorder is fitted with a 12 mega pixel CMOS sensor and equipped with a 8X digital zoom allowing it to capture HD video 720 x 480 resolution at 30 fps. It records your footage as AVI files on an SD/SDHC (max 32GB) memory card and can also take still photos if required. It easily connects to your computer via USB for data transfer and its rechargeable Li-ion battery provide up to 5 hours of operation on a full 3-hour battery charge.